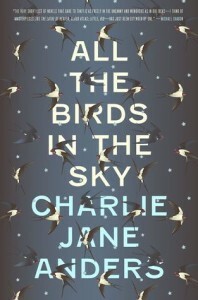 All the Birds in the Sky by Charlie Jane Anders is a perfectly cromulent novel. But there’s nothing about it that set my soul on fire. To be perfectly honest, I’m not really sure why it won the Emperor Norton award. It’s a fine novel, but I didn’t see anything that would be “extraordinary invention and creativity unhindered by the constraints of paltry reason.” in the novel. The plot follows Patricia and Lawrence from childhood through adulthood. Lawrence is a science geek and an inventor. Patricia is a witch. It’s set a couple of years in the future (actually, I suspect they’re supposed to be children in the modern day and their adult lives is about 20 years from now) and humanity has screwed up the earth. They each have a different solution for fixing this, and are bound by the constrains of their respective genres- science and magic- in order to fix the world. There is an exploration about what the different solutions would mean from a philosophy standpoint, and I’m definitely team magic, but honestly, while that’s the basic plot, the novel is really a love story between these two characters. They meet in middle school where they have the horrible experiences of nerds everywhere (times 1,000), grow apart and develop in their respective fields, and then come together again as adults. To be honest, this sounds like it should be crack for me. But it just wasn’t. I was bored for most of the novel. The narration style (as the writers voice, not an audio style) was off somehow and felt very jagged. I appreciated parts of it, but nothing really entertained me nor was I ever enlightened in some way. The plot was both telegraphed quite heavily and bounced all over the place. There are a lot of plot elements, and I never felt they gelled very well. I suppose there are worse ways that you could spend a few hours reading. And you may very well find something of worth in the novel. But me? Meh. I finished it yesterday and already it’s fading pretty quickly. Share the post "I know the birds were supposed to be important because the title said so"
I liked it more than you did, but it was very jagged. It was interesting enough that I’m curious to read what she writes next though. I think her ability to write complex stories will improve with time. It isn’t bad for a first effort, that’s true. And I would probably read another novel by Anders, though I doubt I’ll seek them out. I just wasn’t as impressed as I could tell she wanted me to be. There were a couple of places where I could practically hear the author shouting, “LOOOK, LOOK HOW CLEVER THIS IDEA IS.” Which, hilariously, is a complaint I’ve heard people make against one of my favorite authors. And I did like it, I gave it three stars, I just didn’t think it stood out in any way from other perfectly decent books I’ve read.